My Computer has a Nvidia Geforce graphics card. I use the Firestorm Viewer. SL was running fine until firestorn informed me that it was no longer using my nice Nvidia graphics card, and that it is using my internal Intel Graphics card instead. Now there is too much lag for my avatar to even walk sometimes. How do I tell firestorm to actually use the better graphics card? ubuntu Unable to play Sl using any viewer due to graphics related issues which results in computer shutting down frequently. Hello. I I have been a resident in SL since 2015. This is my first post in this forum because I have been rendered desperate for answers in regards to why my computer shuts down completely and randomly when I am in-game using any viewer and irregardless of the graphics settings in Ubuntu 18.04 64 bit linux. I am a Ubuntu user with a 2013 Acer V5 series laptop with Intel HD 4000 Graphics(and thus uses mesa drivers for OpenGL rendering and intel i915 as my graphics driver) onboard as its integrated graphics adapter. Now hear me out. When this laptop was brand new, I never had these problems using any of the viewers as long as I set it to low settings the worst thing it would do is close the program and not crash the entire system. But as the viewers updated and with drivers and OS versions following the same route, I noticed an increasing demand on the system to the point where I had to use lightweight viewers like Cool VL Viewer in order to be stable. For a while Cool VL viewer seemed to work without any problems, I could travel anywhere,be in any crowd or in a quiet sim without crashing albeit i did had some random crashes that werent fatal and infrequent from time to time but as long as it was set to low settings and object/mesh details were low/mid,everything worked as it should. This was on Ubuntu 16.04 which i had upgraded from not too long ago. I updated my system from Ubuntu 16.04 to Ubuntu 18.04 64-bit and this is where the trouble starts. Now it randomly crashes no matter what I do/where I am after a couple seconds even in Cool VL Viewer. I noticed that when im in certain areas of a sim or if i pan my camera to a certain spot(this used to happen when my camera is rendering potted plants or trees in Firestorm and is a consistent problem with other viewers as well) the likelihood to fatally crash and shutdown is almost 100%. I had found out that a kernel version seemed to help with the problem a bit but then it eventually started crashing even on the older kernel(4.4.137). Also note that i can use other programs that can be equally demanding and they do not crash the system. I have cleaned out the laptop and applied thermal paste to the CPU 4 months ago and I can feel cool air blowing out of the vents so I do not believe this is an overheating issue although it could be. Another notable issue is that the CPU fan is constantly high,even when the system is idle and it started behaving like this when i first cleaned it. Is it truly time to throw in the towel and buy a new laptop or is this a glitch/graphical that i can fix? What is happening to my graphics?? Hello, all. I use a MacBook Pro. I use Firestorm (latest update). My graphics have been working fine (the computer is around 6 months old), until about three days ago. I got these colorful glitchy lines across the screen once I turned my graphics up to ultra, and I haven't been able to figure out how to get rid of them. I tried all the different levels of graphics and they will not go away. The only way they go away is to turn off "Basic shaders" and then my entire screen turns blue ? I already played around with all the various settings, "Advanced lighting model", "Local lights", "Basic shaders", etc. etc. None of them will make the blue screen/glitchy lines go away. The strange thing is, ALL of these options were working perfectly up until a few days ago. I would switch ALM on and off all the time, play with the graphics, switch around the settings with NO problems whatsoever. I haven't updated ANYTHING on my computer and nothing has changed, which is what confuses me. I am also confused because my computer is pretty much brand new. I tried rebooting the computer multiple times and reinstalling Firestorm to the latest version. Attached are some pictures of a grass scene. It is making it hard to see anything in-world.The blue one is with Basic shaders OFF, the glitchy lines is with Basic shaders ON. Both make it very hard to see anything. Also: It is not a windlight thing. I have played with ALL the windlights and no difference. Also changed around the phototools options to no avail. I have a lot of experience with graphics settings/photo tools and Second Life/Firestorm in general and I am truly stumped. There doesn't seem to be any information on errors like this online either. I can't find any way to fix it. Would appreciate any suggestions. Thanks ? EDIT: I have just downloaded the Second Life viewer and I am having NO issues. So it may not be my graphics card. But I cannot change from Firestorm, to be honest. I find other viewers impossible. Is there something I can do or fix to make Firestorm work again? not sure what happened when but within the last week my viewer's showing any and all objects that have any glow in a very irritating way. as you can see by the image, the object seems to duplicate itself. no matter where i have the camera, from the other side of the grid or zoomed in, the anomoly appears. any hints what's causing this? I have no idea whats wrong with my second life. Whenever i login, it appears as shown in the pic. I have tried everything suggested on the forums. I updated my graphics driver. I set my preferences to lowest as possible. I have even changed viewers but nothing helped. its the second time this problem showed up and the last time just switching from Second life viewer to Catznip viewer solved the problem. but this time nothing is helping.. can suggestion?? Face Lights not working, which SL graphics? Can I run SL with my new laptop? I would like to run a SL Viewer (SL or Firestorm (preferred)) on a Windows Hyper-V Guest Virtual Machine. The Host & Guest are running Windows 10 Pro X64. The Host has a dedicated nvidia 1080 graphics card and the Guest VM has been configured to support VideoFX, which includes support for the latest OpenGL. Has anyone gotten a similar configuration to work? Hello! So, I have a very weird issue. I suddenly have all of the colours on my screen doing a very funky thing.. it's like the colours inverted or something. Here is a picture: Notice the black falling snow and everything is in a green/teal tinge. Nope, those are not the normal colours! Any help please? Graphics Card: NVIDIA GeForce GTX 965M I have most recent graphics update. SL performance has drastically gotten worse? Besides the server improvements, and everything that works in the background, which Shinies would you like to see that hasn't arrived yet? mine would be motion blur, it would give a more natural sense of movement. the capability of choosing at which speed would you like to walk, and how many steps would you walk with one click of a keyboard button. mirror reflections, beyond the capability of adding max shine to an object, more like the effect that water have to mirror the environment. 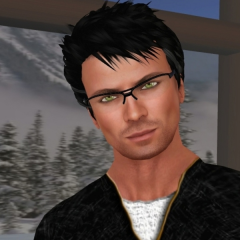 with those features, besides performance improvements, I think that Second Life would be very complete. I am running an Alienware Aurora R6 with NVidia 1070 graphics card and 16 gb RAM under Windows 10. I have run full tests of the video card itself and it is implementing FXAA, transparency antialiasing, and antialiasing up to 8x flawlessly. The problem lies within SL. It appears that ALM and antialiasing are broken in the current viewer versions under both Windows 10 and Linux Mint. I have tried this on two different machines (the other a laptop running Linux mint and an older NVidia card, and the Alienware under Windows 10. The problem is identical on both machines. Even though both video cards support 8x antialiasing, activating antialiasing with NVidia currently appears to be an on/off proposition with a max antialiasing of 2x being locked. Even though I can set higher levels in both the SL and Firestorm viewers, they have no impact. Antialiasing is ether off, or at no higher than 2x. If I activate ALM, ALM activates everything EXCEPT FXAA, and thus NO antialiasing whatsoever is possible under ALM. As a result many objects have jagged edges unless viewed in extreme closeup, especially things like ropes on boats, cards in games, etc. Some textures render horrendously from a few meters away, especially rope textures or objects like picture frames. I have tried manually activating higher antialiasing rates, transparency antialiasing, and FXAA in the video driver, all with no effect. Both the latest versions of SL viewer and Firestorm fail to recognize or utilize them. Has anyone found a fix for this, or is this a known bug in the SL core viewer code? Any ideas or information about this problem would be greatly appreciated. I haven't been able to see any graphics (profile images in the sidebar, smilies, or pasted in screenshots) in Chrome for a day now. I didn't make any changes. I can see things NOW (not last night) in Firefox. Is there a fix for this or is it not me and I just need patience? Thanks. I've been having a issue with the anti-aliasing, with every viewer I have tried. No matter which setting I use in the AA, from 2x to 16x, in the distance, I notice that it's very jagged around the edges of objects which isn't noticeable when you walk/zoom right up on a object but then you notice another object far off in the distance with the jagged edges... that's when I have ALM on (tried with and without shadows) When I turn ALM off, the AA is still bad with the distance issue. My draw distance is always at 256 and I'm using the GTX 1060 6GB graphics card. You have to be zoomed in right on a object... meaning it's even noticeable on my avatar unless I zoom too far in. The only thing that I've found that helps, is downscaling (DSR) but things seem blurry and performance drops. I've seen videos of people using 1050ti cards that look more smooth. On my old AMD R9 280, it handled the AA situation better (not perfectly, which is why I went to the 1060, since everyone I asked said Nvidia works better with SL)... which is a bummer to find the 1060 has worse AA for me. All options in the Nvidia Control Panel are set to application controlled, so there is NO overriding. And again, this happens with every viewer I have tried, third party included. I've taken two photos that show the issues I've been seeing... one snapshot shows the bad aliasing on a object that's far (not too far, showing that the issue is a eyesore for me) and the other snapshot shows it's fine when my camera is RIGHT on it. So hopefully there is a solution and I appreciate the help. EDIT: And I also notice shimmering along the jagged lines when moving.